Diabetes mellitus is a serious medical condition that occurs when there is an insulin deficiency in the body. The role of insulin is to “drive” sugar that circulates in the blood after digestion in to the cells, where it is used for all functions of life. When a patient’s blood sugar is high, sugar spills into the urine along with water, electrolytes, and proteins from the blood. Diabetes in humans occurs in two forms, Type 1 (or insulin-dependent) and Type 2 (or non-insulin-dependent). Insulin-dependent diabetes is the most common type recognized in dogs and many cats, whereas the non-insulin dependent form occurs occasionally in cats and is extremely rare in dogs. Insulin-dependent diabetes develops due to destruction or damage to the cells in the pancreas that produce insulin, this may be due to genetics, environmental factors, or immune-mediated destruction of the pancreas. Non-insulin dependent diabetes mellitus is usually associated with insulin resistance within the body. This type is commonly seen in obese or overweight animals. Insulin resistance can also occur infrequently from inflammation or hormone shifts. Increased water consumption and urination are the two most common signs seen in diabetic dogs and cats regardless of type. 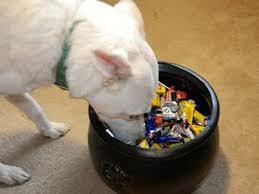 Dogs and cats with diabetes initially often have a good appetite but tend to lose weight, often very rapidly. Additional signs of illness (vomiting, diarrhea, or decreased appetite) may be seen in diabetic animals that are left untreated, or in those that develop concurrent illness that complicates the control of their disease, such as ketoacidosis. Fortunately, dogs and cats do not develop some of the long-term complications that are seen in people with this disease, as their lifespans are shorter than humans. However, many dogs with diabetes will develop cataracts within a year of diagnosis that progress to blindness; this condition often develops even with treatment. Poorly managed cats may develop a condition causing nerve damage, and can lead to hindlimb weakness and incoordination; this may or may not be reversible with treatment. Diabetes mellitus is diagnosed by the presence of elevated blood glucose (sugar) and glucose in the urine. Stress can also cause elevation in blood and urine glucose in cats, which may make the diagnosis trickier. Additional tests may be recommended to confirm the diagnosis or to screen for other conditions commonly seen (ie. urinary tract infections). Treatment of diabetes mellitus may include diet change, weight loss, and insulin therapy. If insulin resistance is suspected, identifying and treating concurrent disease is an important part of diabetic management. The exact treatment recommendations vary and need to be determined by the veterinarian managing the case. Most animals have insulin-dependent diabetes and insulin injections are necessary twice a day. In 15% of cats diabetic remission is possible, so insulin use may be avoided altogether or only needed transiently. Insulin needs can vary, so different insulin types, doses and even frequencies may be attempted until your dog or cat becomes controlled. Careful insulin handling and refrigeration is required. Once an animal is started on treatment, regular veterinary visits are needed to evaluate control and periodic check-ups are recommended for ongoing monitoring. Ultimately, the goal in treating most animals with insulin dependent diabetes is to minimize clinical signs, since “curing” the disease is usually impossible. Overall prognosis for an animal with diabetes mellitus is good for most pets treated appropriately. Many of these animals are able to live healthy lives with dedicated owner commitment. Treatment might initially appear overwhelming, but, with time can become an easy part of your pet’s daily routine.